President Reuven Rivlin this morning (Wednesday) addressed a welcoming ceremony at Ben Gurion Airport for 233 new Olim (immigrants to Israel) from North America, who made Aliyah on a special flight organized by Nefesh B'Nefesh. The President also presented the organization's 50,000th Olah, Rebecca Glanzer, 22, from Brooklyn, with her Israeli ID card. The welcoming ceremony was held in partnership with the Ministry for Immigration & Absorption, the Jewish Agency, KKL (JNF-USA), and the Israeli Scout Movement. 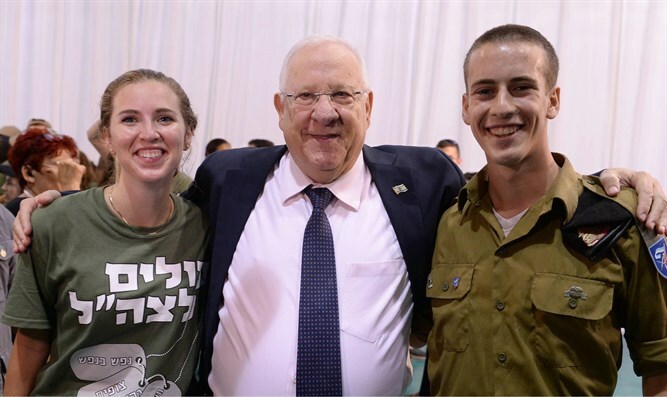 Among the new arrivals were more than 70 young men and women set to enlist in the IDF as lone soldiers, and six young women due to begin civilian national service. "It is such an honor for me to join you at this special special moment," began the President, and added, "the moment you have all come home. You are no longer 'Jews in Exile', you are all Israelis. Each of you, young and old, men and women, have fulfilled the dream of 2000 years, you have made Aliyah." He said, "Just this week we marked Tisha B'Av, when we remember the destruction of the First and Second Temples in Jerusalem. The destruction of the Second Temple symbolizes the beginning of the long exile of the Jewish people. For nearly 2,000 years the Jewish people have known exile. For nearly 2,000 years, the Jews dreamt to return to the land of our forefathers. For you, dear new Olim, the exile that began then ends today. Now you are home. Welcome to Israel. Welcome to Zion. Welcome home." President Rivlin added, "I know the decision to make Aliyah is not easy, leaving behind family and friends. Looking for work, starting in new schools, learning a new language. There are many challenges ahead. But we are all here to support you and help you." He concluded, "Dear new Olim, in just a few moments you will leave the gates of the airport and on to your new lives. We welcome you with open arms on your return to Zion, our land is your land, our home is your home. Together we will continue to build and grow here a prosperous country. Welcome."